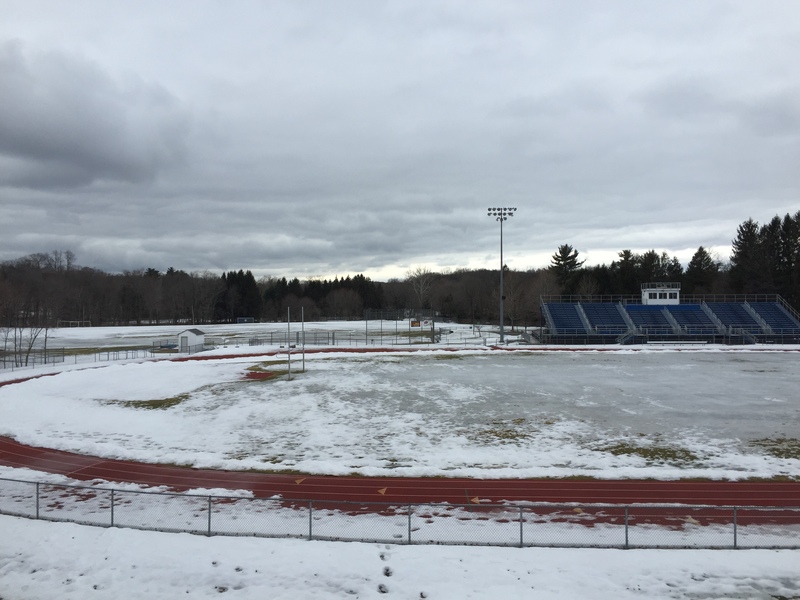 Despite the thick layer of snow still covering the Northampton High School (NHS) playing fields, spring athletes are finding ways to start their season on time and hit the ground running. After a winter that produced 62 total inches of snow, there was some concern from athletes and coaches as to whether or not teams would be able to properly prepare for their spring sports seasons. With fields still unplayable now into late March, many teams have had to seek out alternative venues, such as the Smith College athletic facilities and the NHS gym. Emily Biggs, senior co-captain of the girl’s varsity lacrosse team, said practice conditions will be good this week for the lacrosse teams thanks to Smith College’s turf facility. However, next week’s practice venue is still unknown. “We’re not really sure what will happen, the worst being us practicing in the parking lot, which has happened before,” said Biggs. From fields to courts, Ben Sharpe, senior co-captain of the boy’s varsity tennis team, said that the team is currently using Smith College’s indoor tennis courts while waiting for the snow to melt at JFK Middle School, their regular practice location. Due to lack of money in the budget, there were and are no scheduled snow removals from the courts. The team did make an effort to shovel the courts, however, not much progress was made. “Ten kids shovelled for two hours and we only got half of a court cleared.” While Sharpe said that the tennis team is eager to get outside, they are content with Smith’s indoor facilities for the time being. The baseball team is not as lucky, and has been forced to resort to using facilities not meant for their sport, using the NHS gym host tryouts. Even when the team does get outside, field conditions will be wet, muddy, and sloppy. “Kids who take it seriously always find ways to play,” said Sharpe in regards to other Western Mass. high schools without access to indoor courts. Optimistically, Sharpe said, the team plans to hit the outdoor courts at JFK Middle School later this week, but it all depends on the New England weather. With snow still on the ground, and a chill in the air, it hardly feels like spring. But spring sports march on through March, searching for a place where the grass is greener. Content and multimedia content © 2019 Devil's Advocate. All rights reserved.